NETWORK FINALS: THE CARMICHAEL SHOW, 60 MINUTES and MADAM SECRETARY each adjusted down by 0.1 in final numbers, as did the reruns of LITTLE BIG SHOTS and THE SIMPSONS. CABLE HIGHLIGHTS: AMC devoured another Sunday night, as THE WALKING DEAD rose 0.08 to 6.04, and TALKING DEAD gained 0.07 to 2.41, with COMIC BOOK MEN down 0.02 to 0.35. Bravo’s REAL HOUSEWIVES OF ATLANTA jumped 0.28 to 1.40, and REAL HOUSEWIVES OF THE POTOMAC climbed 0.09 to 0.78. The top NCAA TOURNAMENT game of the night was TBS’s coverage of Oregon vs. St. Joe’s at 1.09. Discovery’s NAKED & AFRAID slipped a tick to 0.83. On Showtime, SHAMELESS fell 0.05 to 0.63, and BILLIONS ticked up to 0.38, while THE CIRCUS added a hundredth to 0.07. HBO continued to be led by LAST WEEK TONIGHT, down 0.04 to 0.34, while GIRLS rose 0.02 to 0.24, VINYL continued to be very steady at 0.21, and TOGETHERNESS ticked up to 0.11. Adult Swim’s ROBOT CHICKEN lost a tick to 0.59, and VENTURE BROTHERS was down 0.02 to 0.46. Spike’s BAR RESCUE fell 0.07 to 0.42, while LIFE OR DEBT was up 0.04 to 0.24. On Food Network, ALL-STAR ACADEMY dropped 0.03 to 0.38, CUTTHROAT KITCHEN fell a tick to 0.36, and GUY’S GROCERY GAMES lost 0.07 to 0.30. TLC’s LONG LOST FAMILY was down 0.05 to 0.37, and LONG ISLAND MEDIUM held at 0.36. 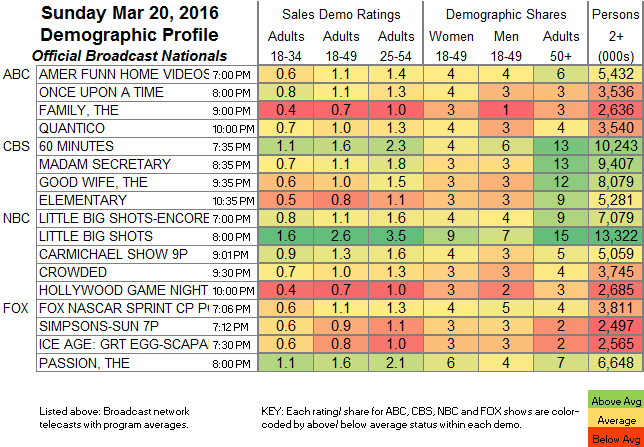 A&E’s HOARDERS was up 0.07 to 0.37, and INTERVENTION held at 0.36. 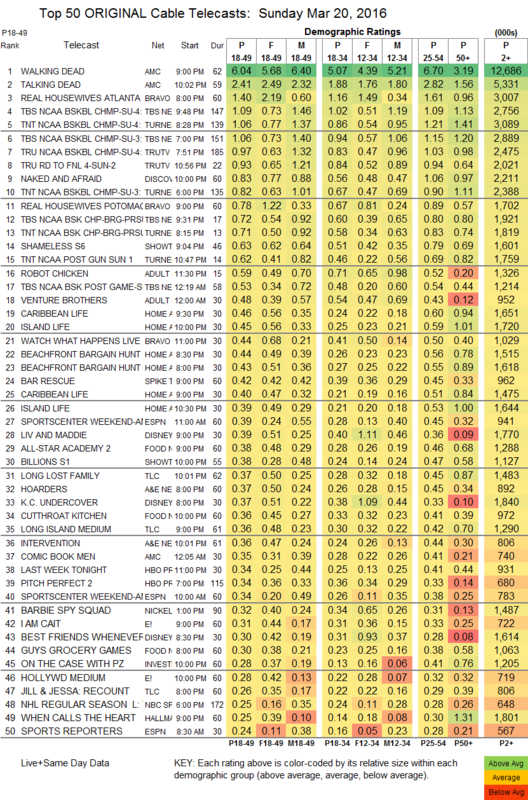 On E!, I AM CAIT lost a hundredth to 0.31, and HOLLYWOOD MEDIUM was up 0.02 to 0.28. Hallmark’s WHEN CLAIMS THE HEART rose 0.04 to 0.25.